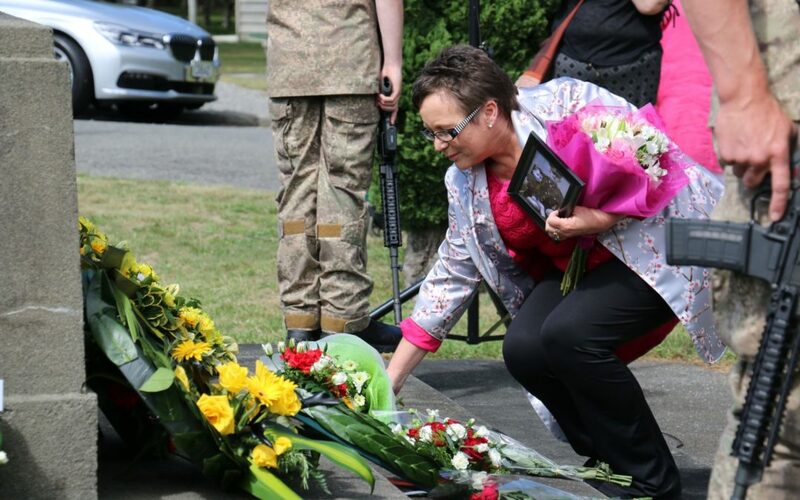 Clasping flowers and a framed vintage photograph, Internal Affairs Minister Tracey Martin remembered her grandfather who was a guard at the Featherston prisoner of war camp during World War II. 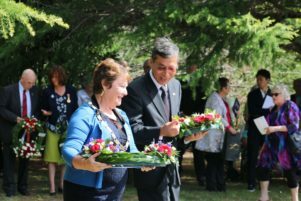 She was one of many who attended a moving ceremony at Memorial Gardens on Sunday to commemorate the 75th anniversary of the Featherston Incident, in which 48 Japanese prisoners and one New Zealand guard died. Ms Martin said that her grandfather, Kenneth Martin, was the second highest ranking officer at the POW camp. “It was his gun that was taken by the adjutant that shot Adachi, the interpreter, and that is what started the riot. “Adachi came back here as an old man and he blessed the Japanese Memorial. At the time, both men were asked who was to blame. South Wairarapa Mayor Viv Napier and Japanese Ambassador Toshihisa Takata. Ms Martin said her grandfather was deeply affected by the incident. Japanese Ambassador Toshihisa Takata delivered a message to the people of Featherston from Japan. It would have been impossible to comprehend the positive relationship that Japan and New Zealand now had at the time of the 1943 incident, Mr Takata said. He said former South Wairarapa Mayor Adrienne Staples had played an integral role in what could now be described as a strong bond. Warrant Officer Class 1 Pete Albrett, of Masterton, takes a quiet moment at the Japanese Memorial. Mr Takata was eternally grateful to Featherston and the wider South Wairarapa community for the enduring hospitality shown to Japanese residents and visitors alike. The Australian town of Cowra was also home to a POW Camp, where a similar incident broke out on August 5, 1944, in which four Australian soldiers and 231 Japanese soldiers were killed. On behalf of the Cowra Council, Graham Apthorpe spoke at the service. He said Cowra and Featherston, with their POW camps, had experienced the tragic loss of life on both sides, allied and Japanese. After the ceremony, Warrant Officer Class 1 Pete Albrett, of Masterton, paid his respects at the Japanese Memorial. 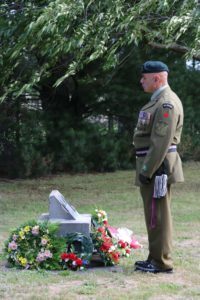 His grandfather, originally from Petone, served with the Otago Regiment in France in 1917 and 1918 during World War I.
Mr Albrett said his grandfather was one of few soldiers who marched over the Rimutaka Hill twice — from Wellington to the Featherston Military Training Camp and then back again to head off to war.